As the Fish of the Month for November, there will a bag of 8-9 x Aulonocara maulana "bi-color 500" around 5-8cm available at the PCS Meeting for auction. An instant breeding colony. These are special lots to raise money for Stuart Grant Fund for Cichlid Preservation and have kindly been donated by one of our PCS Members - Brenno71 (Brendon). 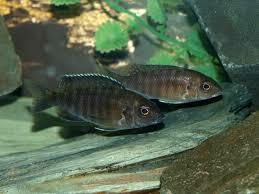 This species is from Africa: Lake Malawi. Only found in areas around Chitimba Bay. Common names: Bi-color 500, Bi-color, Bi-color Peacock. Named after Alfred Maulana, one of Stuart Grant's dive team leaders, who discovered this population at Chitimba Bay, Malawi. Like many peacocks, A. maulana is found in areas with scattered rocks on a sandy bottom, but it is limited to just Chitimba Bay. It shares this location with another, very closely-related Aulonocaraspecies - Aulonocara masoni. They occupy different habitats, however, with the masoni occuring at 22 meters and the maulana occupying the habitat at just 5 meters depth. It is characterized by a broad yellow band around its collar and shoulder, which has earned the trade name "Bicolor." The designation 500 came about because this fish was listed as item number five hundred on Stuart Grant's stock list. The masoni differs from the maulana in that it is practically solid blue, with just a little yellow splash at the base of its ventral fins and on the ventral fins themselves. Maximum length is around 5″ (13cm). 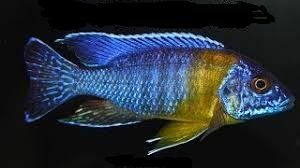 Aulonocara maulana is found in areas with scattered rocks on a sandy bottom, but it is limited to just Chitimba Bay. Like all Aulonocara species, Aulonocara maulana has sensory pores on its face. With these they can sense movement underground on the lake floor from worms, snails, insect larvae, etc. It feeds on invertebrates that dwell in the sand by lying motionless over the sandy bottom, sensing micro-movements in the substrate. When it finds a target, it darts rapidly into the sand and sifts it by shooting the sand out its gills while retaining the acquired treat. They are carnivorous - as such, in the aquarium it prefers live foods such as blood worms, snails or brine shrimp, but will generally accept frozen, quality flake or quality pellet foods. Semi aggressive. Generally peaceful but may become territorial, particularly while spawning. Aulonocara maulana is pretty easy to care for. The fish is generally shy and peaceful, but once in a while, a rogue male will develop. 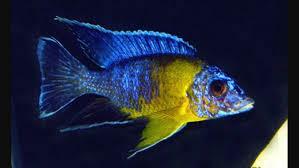 In the aquarium environment, this cichlid species is best kept with other docile cichlids. Mbuna are too rambunctious for this slow-moving and peaceful peacock. Other peacocks and many of the gregarious Haps and Utaka (e.g., C. moorii, O. lithobates, and Copadichromis spp.) work well as tank mates. They should also be kept in tanks no smaller than 50 gallons if kept with other species as they reach adult lengths of 4-5 inches. Larger sandy areas are required for feding and plenty of swimming areas. Some rocks to the rear and sides of the aquarium for aggression and breeding. Water Changes: To prevent the water from becoming too polluted, it is recommended to carry out a monthly renewal of 20% to 30% of the volume of water. Be careful, the added water must be at a temperature close to that of the aquarium. Water Changes: Weekly - Water changes of 30% weekly are recommended. 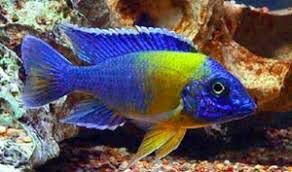 The Aulonocara, along with the Utaka Cichlids Copadichromis and other non-Mbuna's, are members of the Haplochromis group. Haplochromis is the type genus of free-roaming browsers sometimes call "haps". They live in more sandy areas and open waters, and are generally larger cichlids than their Mbuna "rock-dwelling" counterparts. 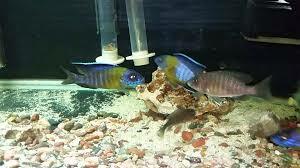 They also are more peaceful cichlids and should not be housed with the highly active and aggressive Mbunas. The fish has a mellower temperament than other peacock cichlids. Even when spawning, they are less aggressive. Consequently there is a greater selection of tank mates you can keep with this cichlid species. They are also easy to care for, thus making them a desirable pet. Provide open space for swimming and a lot of caves in which to hide, sleep, or breed. Water changes that are frequent also help in keeping this cichlid. They will eat a meaty diet and have an almost puppy like excitability when being fed, thus adding to their appeal. Aulonocara maulana is not hard to breed. Once you get the fish breeding they will spawn readily. Spawning is typical for peacocks. The Bi-color Peacock has a mouth brooding term of about 21-24 days. The eggs are relatively small, and numerous. The females generally hold term with no issues. Fry grow quickly, hitting an inch within a month. A 40-gallon aquarium with only 1 male and 6 females would be an ideal breeding set up. Males tend to be rather aggressive towards females; therefore, it is recommended keeping several females for each male in order to reduce the level of aggression directed at any one female. Broods for adult-sized females range anywhere from 20 to 40 fry. 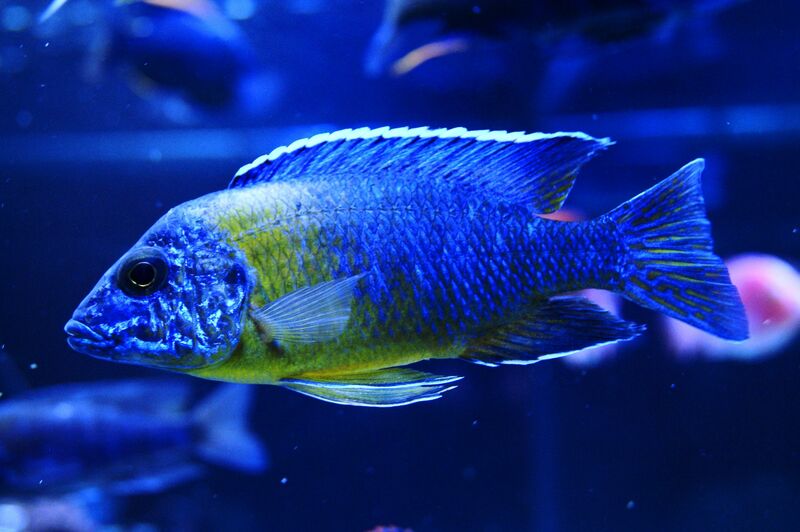 Peacock Cichlids are ovophile mouth brooders that form a matriarch family. The pair should be conditioned separately on mosquito larvae, blood worms, and crustaceans. The water should have a pH from 8.0-8.2, a water hardness 10-18 dH, and a warmer temperature of 79-84F (26-29C). The female spawns a small number of eggs on the rocky bottom. These are fertilized by way of the dummy-egg method. The young should be raised on newly hatched Artemia and fine-grade flake foods.